Tim Oswald, the “one-man show” behind Harpan LLC games, is now $42.5 million richer. Zynga, the gaming app development company, has acquired the app developer’s Solitaire games, in what appears to be an all cash deal stated to have taken place on the 14th of February, 2017. While information on Harpan LLC and Tim Oswald is tough to lay hands on at the moment, what we do know is that Tim isn’t just the owner and CEO alone, he is also the only employee in his startup. The company made a name for itself after it produced its one game- Solitaire- for Android as well as iOS. Following the success of Solitaire, Oswald proceeded to create different versions such as FreeCell, Pyramid, and Spider Solitaire. As of date, there are over 150 million people who play Harpan LLC games, and Solitaire accounts for a majority of the users. Why Did Zynga Want Solitaire? The Harpan LLC acquisition is Zynga’s first acquisition for the year 2017. It comes as part of its renewed focus on developing forever franchises while continuing to maintain strong live ops. Zynga CEO, Frank Gibeau, asserts that what the company needs right now is to invest in live ops. Whether spent on R&D or marketing, an investment in live ops should provide the company good returns on investment. The company has also been focusing on launching newer games, with the firm belief that the company needs to innovate to maintain long-term franchises continually. With regard to Harpan and how it fits in with Zynga’s new strategy, Gibeau states that Harpan fits in perfectly considering it is a social card game company that is supported by advertising- Something Zynga is keen on generating more revenues from. Going by what Seeking Alpha reports, the Harpan LLC acquisition by Zynga is all part of the latter’s FY16 10-K filing. While none of Harpan LLC’s games are blockbusters, their performance on Android and iOS App Stores is commendable. 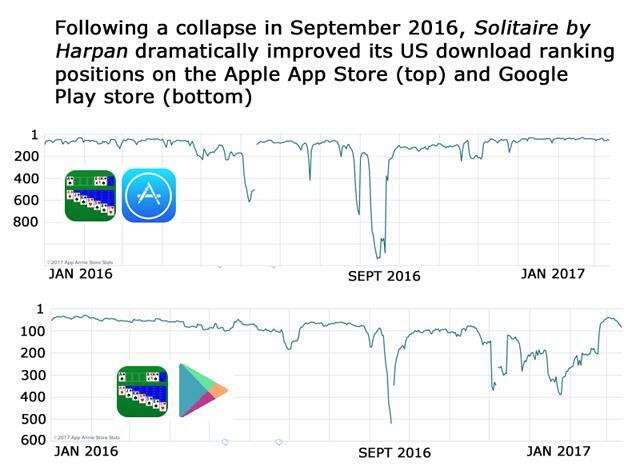 Given as Solitaire is currently one of the top 50 games on the Apple App Store download chart for the U.S., Zynga sees an opportunity to increase its revenues from in-game advertising by investing in the game. Further, the company had about $852 million in cash and equivalents as of 31 December 2016, meaning this particular investment is not exactly going to put a big dent in its pockets. Started as an American video game developer since 2007, Zynga rose to glory in the next three years and began trading on NASDAQ in 2011 with shared priced at $10. After reaching $14.5 per share in March 2012, however, the company began seeing a steady fall in share price. The company’s continued downfall invited attention from analysts and journalists who questioned its long-term prospects. Following that 2012 scare, however, Zynga has been taking steps to cut expenses and expand the business. It now operates in areas such as licensed board games, online gambling, Its gaming platform- Zynga.com, and mobile game apps. The migration to mobile seems to be where the company struggles the most and consequently lost a lot of ground to competitors as well. To make it worse, the end of the partnership with Facebook really hit Zynga hard. Partnering with Facebook helped the startup grow magnificently and even brought the company to the fore for an IPO of $1 billion. Following the end of its Facebook partnership, Zynga was forced to launch games on separate platforms. Meanwhile, the mobile gaming market was taking off. Not only did Zynga fail to take notice of the opportunities that lay open for it on mobile gaming platforms, but it was also unable to tap into it immediately. This failure by Zynga to capitalise on the new-born and rapidly growing mobile gaming platform cost it a sizeable portion of revenue. In May last year, company’s valuation tumbled down below than market price of its own headquarter building. 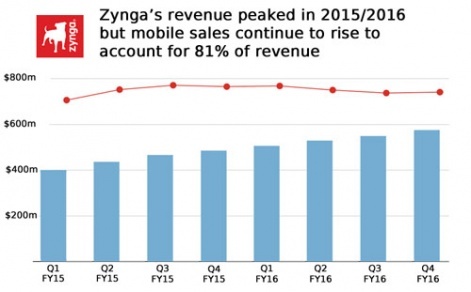 This was the time when few market analysts started visualising the beginning of the end of gaming behemoth Zynga. Frank Gibeau, who replaced Mark Pincus as CEO of Zynga in 2016, has been able to slowly, but steadily, bring the company out of the troubled waters it has been sinking in. For one thing, Gibeau decided to let Facebook go entirely and began to focus all of Zynga’s attention on mobile. Further, Gibeau revised the company’s working model and revamped the company’s talent pool by hiring the right kind of people. The growth of Zynga’s mobile-driven revenue is so significant that its FY2016 GAAP sales were up by 18% when compared to FY2015. In fact, as of Q4 2016, it posted mobile revenues of $155 million, while EA mobile’s stood at $148 million, meaning that it has now managed to generate more mobile game revenue than gaming giant EA.